I think this was one of my favorite Doodlebug assignments to date: "Search through the Doodlebug Pinterest pages for ideas. 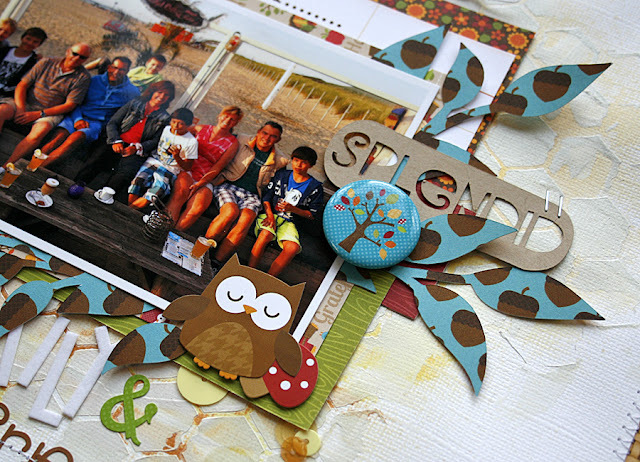 Create something that is inspired by a PIN you found on the DB boards." This was so much fun! There were so many fabulous Doodlebug projects to look at. I took me forever to even start looking for one to use for this assignment. I just kept looking at all the fantastic projects. In the end I decided to narrow down my search to projects of only one person. 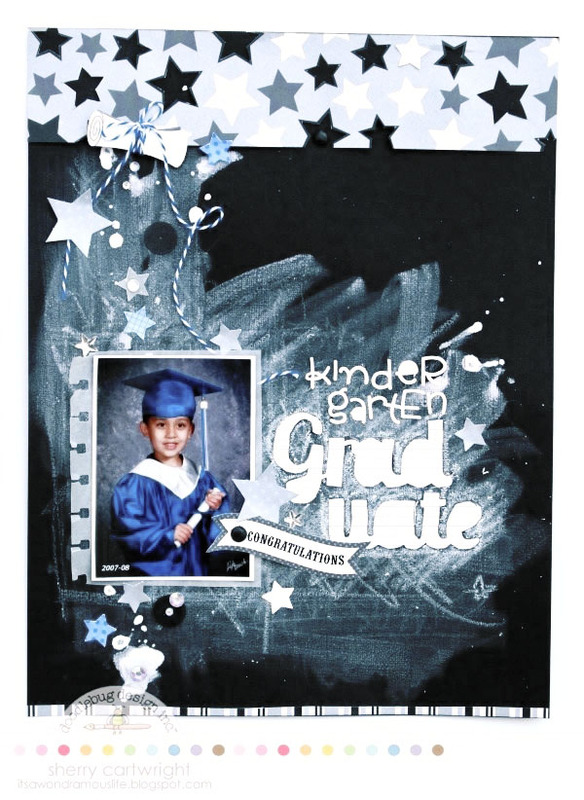 I chose a design team member who has a completely different scrap style than I have: Sherri Cartwright. I have always loved the backgrounds of her layouts and wished I could do that too (but was afraid to try). So that's what I did and this is the end result: An "I am thankful for family and friends" layout with a mixed media background. The background was created using a TCW template (chicken wire it's called) and lots of gesso. When the paper was dry again, I sprayed on three different mists and used a tissue to whipe off the excess. As I had some problems getting my paper "straight" again I trimmed half an inch of all sides of my cardstock and machine stitched it to a patterned paper. This way my layout is not so "wavy" any more. Except for the painted background, I also incorporated the twine and the little bits and pieces that are "randomly" spread over the page in my layout. I really like how this turned out and will definitely try this technique again. Hope you like it too! If you ever feel like using one of the Doodlebug projects for one of yours don't forget to show us, for example on Doodlebug's facebook page! We would love to see it! Thanks for visiting Doodlebug's blog! Happy scrapping! Such a gorgeous page, Monique! Love your background, and all the cool details. Love your fabulous textured background and the page as a whole!